I’ve accepted the fact that I’m going to have to sit out the next Bloom Day too, because of the ridiculous amount of snow currently blanketing everything here in southeastern PA. We’ll be lucky if this stuff melts in time for March’s Bloom Day. Well, never mind: It’s a great excuse to roll around in more color in my photo archives. I didn’t expect to find nearly as much orange as I did red for my last post, but I was happily surprised. 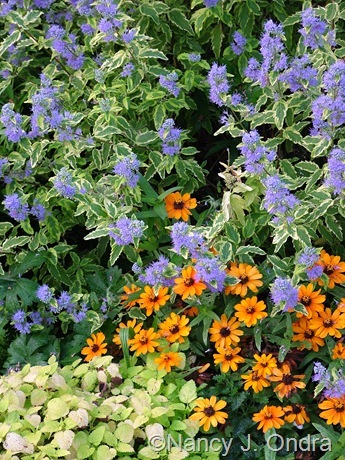 …with Caryopteris x clandonensis ‘Summer Sorbet’ and more ‘All Gold’ lemon balm’ [above]; and with ‘Chocolate Chip’ ajuga, ‘Sweet Caroline Bronze’ sweet potato vine, ‘Maple Sugar’ hibiscus (Hibiscus acetosella), and Rudbeckia fulgida [below]. Narrow-leaf zinnia (Zinnia angustifolia), one of the parents of ‘Profusion Orange’, isn’t quite as richly colored and has a looser, wilder look. I like it, but not as much as ‘Profusion Orange’. 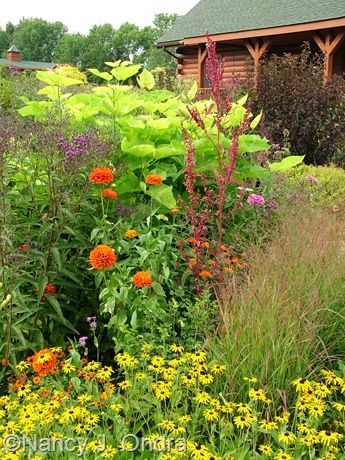 When I need something taller, I go for ‘Aztec Orange’ [above with golden catalpa (Catalpa bignonioides ‘Aurea’), red orach (Atriplex hortensis ‘Rubra’), ‘Rotstrahlbusch’ switch grass (Panicum virgatum), Rudbeckia fulgida, and ironweed (Vernonia)]. 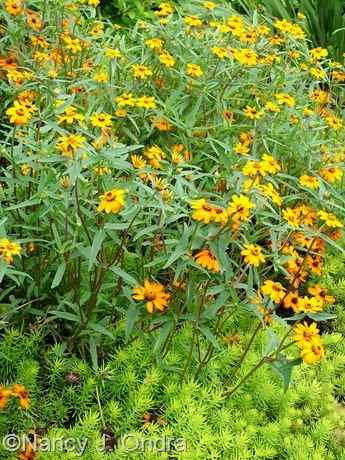 I like the strong scent of signet marigold (Tagetes tenuifolia) foliage, and I usually get it from the bright yellow-flowered ‘Lemon Gem’. 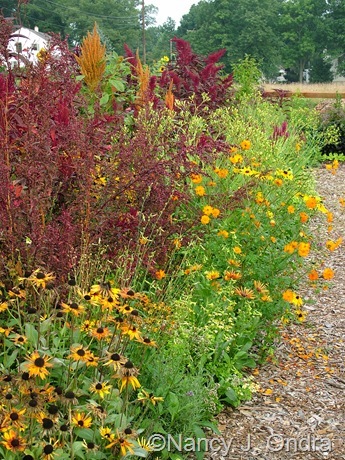 But sometimes I also grow ‘Starfire’ [above with Persicaria capitata], which includes some rich oranges with the yellows. 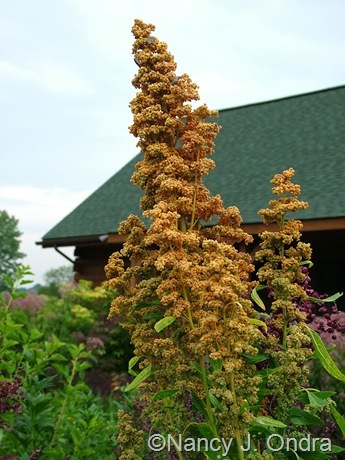 One year, I tried the ‘Brightest Brilliant Rainbow’ strain of quinoa (Chenopodium quinoa) from Wild Garden Seeds. This rusty orange one was my favorite of the bunch. 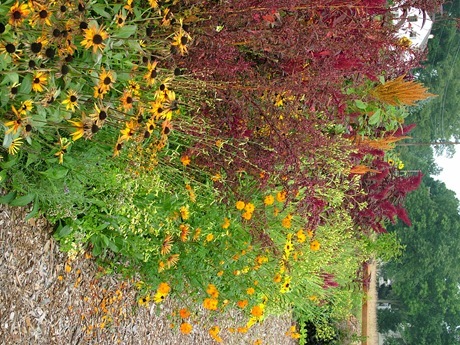 ‘Hopi Red Dye’ is my usual amaranth of choice, but sometimes I also grow the orangey ones, such as ‘Orange Giant’ [above with ‘H.R.D.’ and below with ‘H.R.D.’, red orach, orange cosmos (Cosmos sulphureus), and ‘Chim Chiminee’ Gloriosa daisy (Rudbeckia)]. 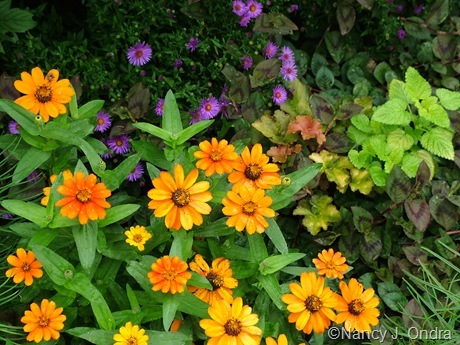 ‘Chim Chiminee’ Gloriosa daisies include a mix of colors: some are clear yellow, but many have at least a touch of orange. Above, they’re with ‘Jester’ purple millet (Pennisetum glaucum). 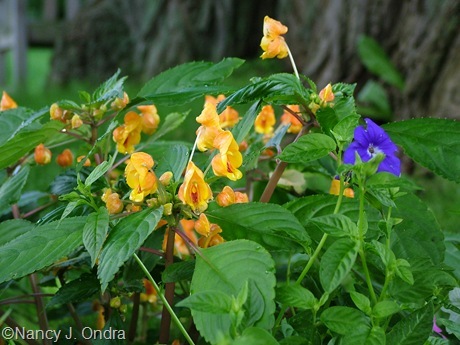 One more orange from among the annuals: ‘Jungle Gold’ impatiens (Impatiens auricoma) [above with a blue browallia]. 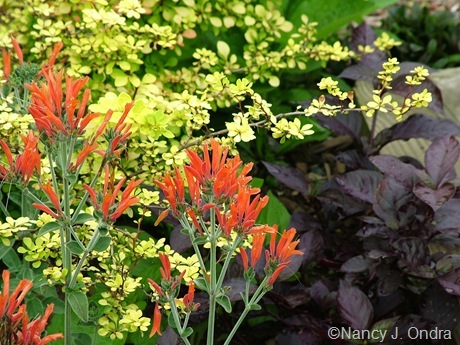 Now, for the tender perennials: ‘Emily McKenzie’ crocosmia [above with ‘Angelina’ sedum and ‘May Night’ salvia] and a hybrid foxtail lily (Eremurus) [below with red orach and Viburnum opulus ‘Aureum’]. 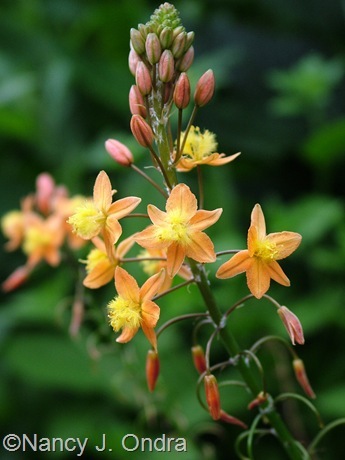 Above is what I’m pretty sure is bulbinella (Bulbine frutescens). It was short (maybe 12 inches here) but sweet. Dicliptera suberecta [above] was popular around here in the mid-90s, but it’s tricky to find now. 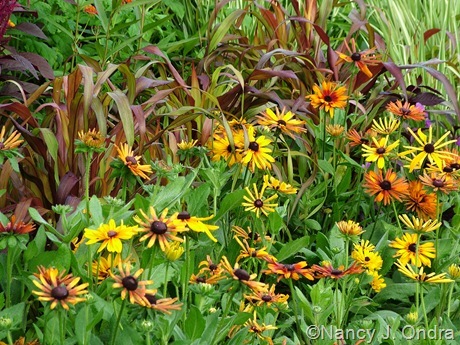 I’m always happy to grow it when I can; it’s such a great orange, and the furry gray foliage is nice too. 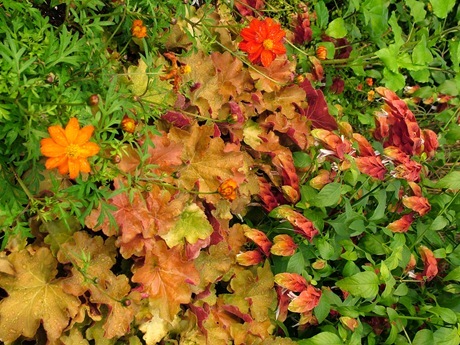 Shrimp plant (Justicia brandegeana) [above], too, is tender here, and ‘Bright Lights Mix’ cosmos are annuals, but orangey ‘Caramel’ heuchera is dependably perennial (when not eaten by voles). Arkwright’s campion (Lychnis x arkwrightii) produces some great oranges too. Above is a seedling from a pack of ‘Vesuvius’. I’ve heard people complain about ‘Fireglow’ euphorbia [above], but it’s been well behaved for me, and the orange is terrific. 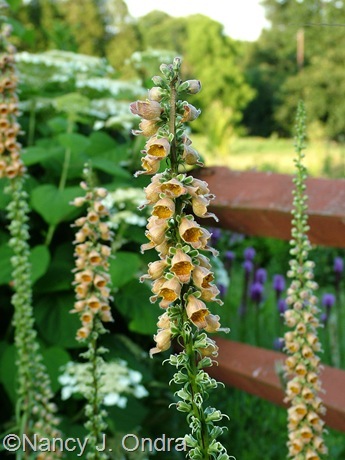 Giant rusty foxglove (Digitalis ferruginea ‘Gigantea’) [above] is a very gentle orange, but it still counts. So does ‘Mango Lassi’ geum [below]. 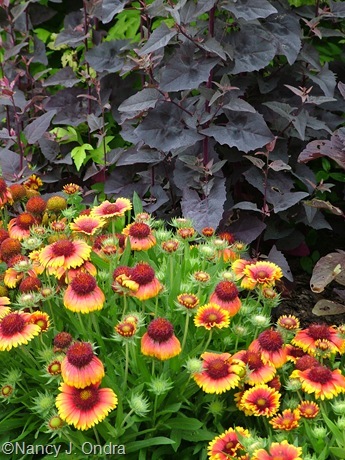 ‘Arizona Sun’ blanket flower (Gaillardia x grandiflora) [above] could have been in the red group, but it’s orangey too. On the whole, I haven’t had much luck with the fancy new echinaceas, but I do like Sundown (‘Evan Saul’) [above], especially when the flowers are new and definitely more orange than pink. 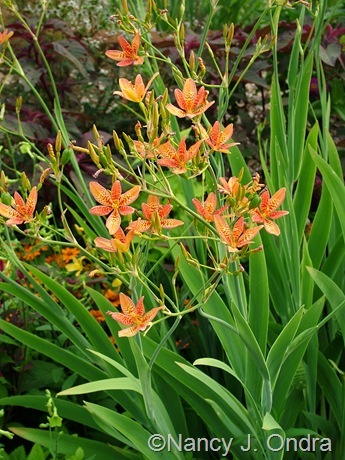 Blackberry lily (Belamcanda chinensis) [above] is a great orange for mid- to late summer – usually late July around here. ‘Britt-Marie Crawford’ ligularia (Ligularia dentata) [below with the hips of Rosa achburensis] flowers a few weeks later, around late August. 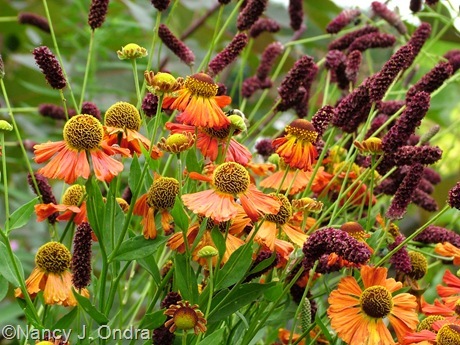 Sneezeweed (Helenium) is another late-August bloomer [above with Sanguisorba tenuifolia]. And then, of course, there are chrysanthemums. 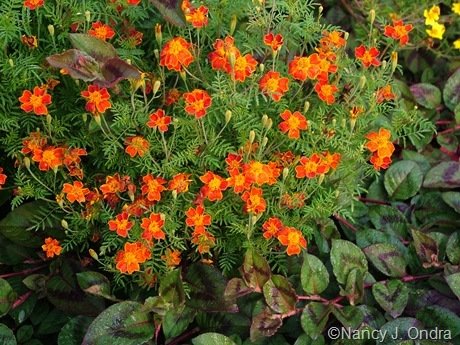 Below is one of my favorites, a lost-label pumpkin-orange mum, with ‘Taurus’ fleeceflower (Persicaria amplexicaulis). 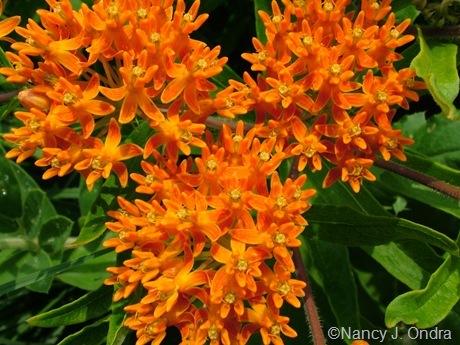 There are some great oranges out in the meadow too, such as the flowers of butterfly weed (Asclepias tuberosa) [above and below]. 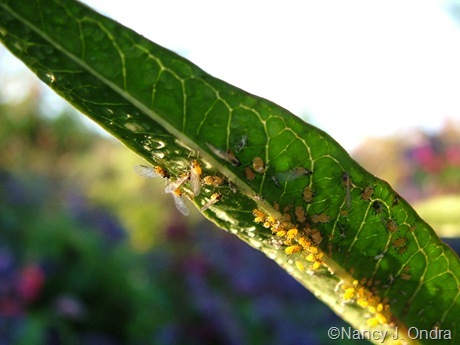 Milkweeds also contribute orange in other forms, such as milkweed bugs [above] and orange aphids [below]. 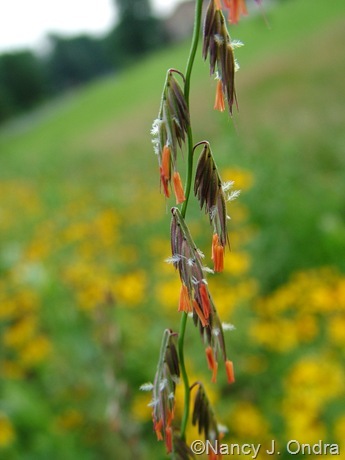 One more meadow denizen in this color group is sideoats grama (Bouteloua curtipendula), with dangling orange anthers. 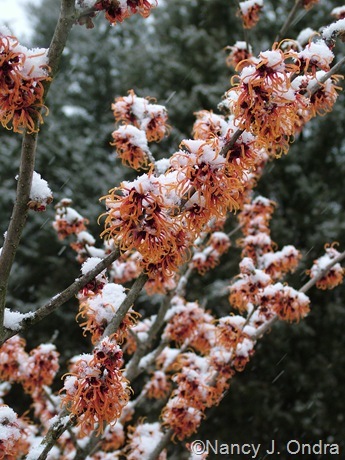 A few more orange flowers: ‘Dropmore Scarlet’ honeysuckle (Lonicera x brownii) [above], and ‘Jelena’ witch hazel (Hamamelis x intermedia) [below]. Oranges abound among the fruits, too. 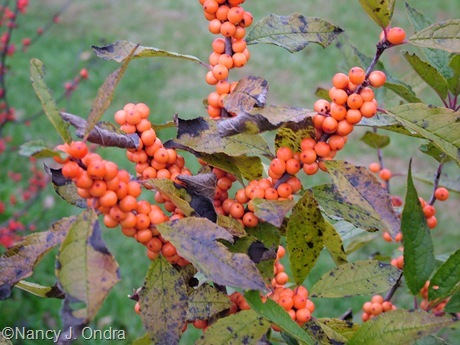 Below are the berries of ‘Winter Gold’ winterberry (Ilex verticillata). 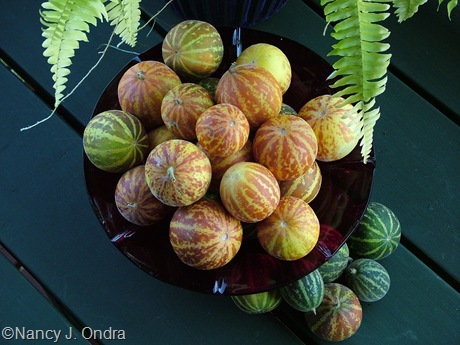 The fruits of Queen Anne’s pocket melon [above], also known as plum granny, are a really nice orange (with orangey yellow stripes) when fully ripe. 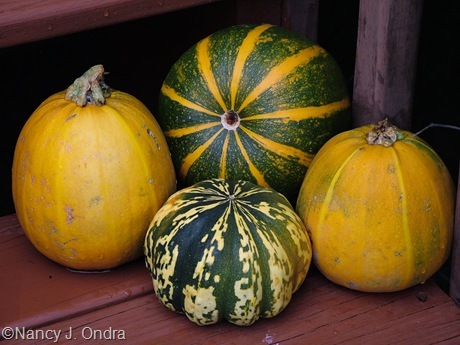 So are ‘One Ball’ zucchinis [shown below with a striped, very ripe ‘Eight Ball’ zucchini and a speckled ‘Carnival’ acorn squash]. One more great orange: the fruits of variegated Jerusalem cherry (Solanum capsicastrum ‘Variegatum’). 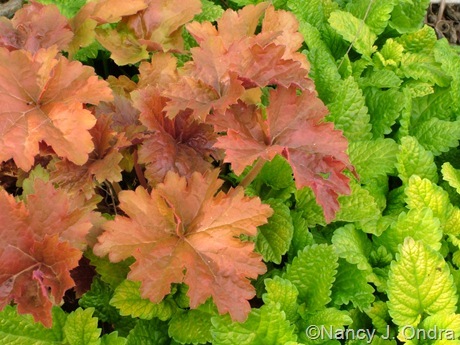 Now for some orange foliage, starting with ‘Creme Brulee’ heuchera [below with ‘All Gold’ lemon balm]. 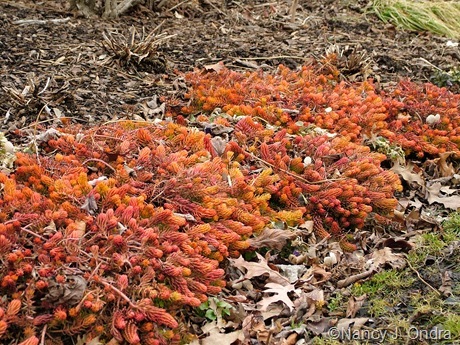 Above is ‘Angelina’ sedum showing particularly good winter color. Below is the tender Sedum nussbaumerianum. Its foliage color is not as intense, but it’s definitely orange all season. Magic Carpet spirea (Spiraea japonica ‘Walbuma’) [below] is distinctly orange in spring; later it’s mostly yellow, but with orange-tinged shoot tips. 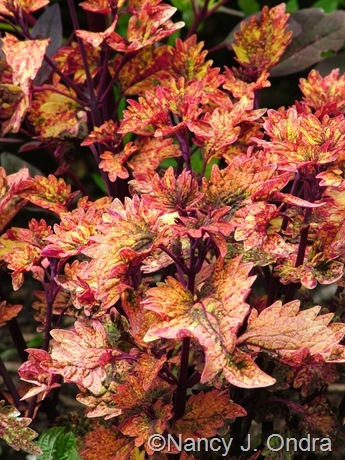 ‘Smallwood’s Driveway’ coleus (Solenostemon) [above] has many colors in its leaves, but from a distance, it mostly reads as orange. 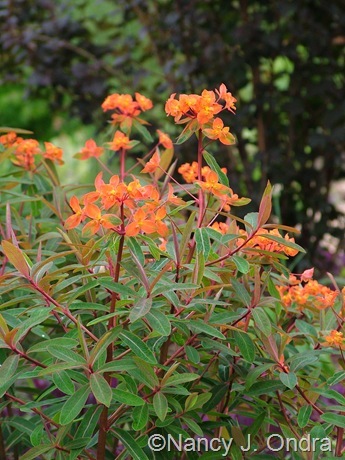 ‘Sedona’ [below with Euphorbia ‘Flame’] is sometimes a pinkish to brick red – especially at the shoot tips, and when the weather is cool – but can also be distinctly orange. Not all ‘Bright Lights’ chards produce these fabulous orange stems, but if I’m lucky, I can get one or two a year like the one above. 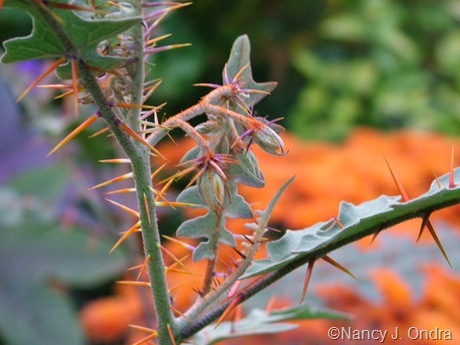 And then there are orange spines, such as those of Solanum pyrancanthum [below]. 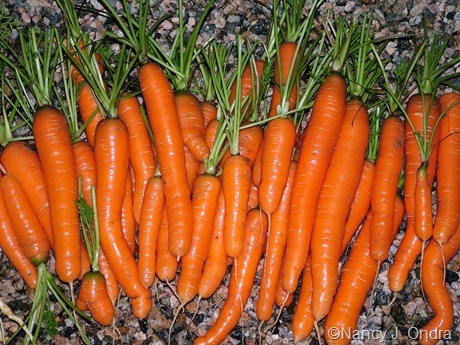 There are even orange roots, like these lovely ‘Meridia’ carrots [below]. Some fresh-picked carrots sure would be a treat right now. But for the time being, I think this is the only orange I’m going to be spending any quality time with. Keep digging, Mom – it’s really deep out here! No worries, Frances, the snow isn’t *quite* as deep as it looks: I shoveled out paths for the boys to walk on and a few places for them to kush (lay down) in. Daniel was kushing when I took that picture. Still, we have over 2 feet on the ground from the last two storms, and more on the way for Monday (sigh). 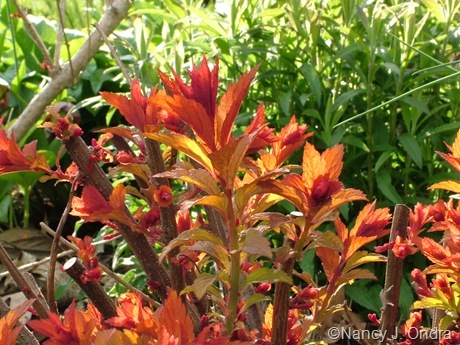 I’m glad you liked the post, and the glorious profusion of ‘Profusion Orange’! I am always amazed at your great plant combinations. Beautiful! I also have an old, forgotten-name orange mum. It’s a stand-out beauty in the fall. It should be divided this year. 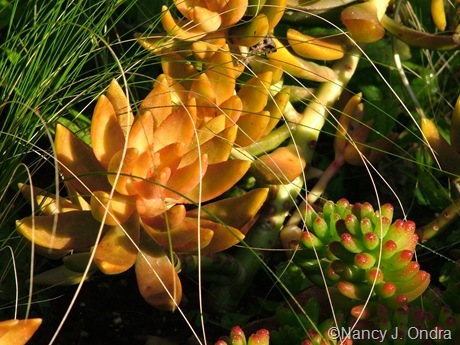 I can look to your photos of “orange” for planting inspiration. Thanks for visiting, Marie. I’m sure you’re as tired of looking at white as I am! Nan, what a lot of orange plants you have. Lovely pictures which I hope makes you look forward to summer. 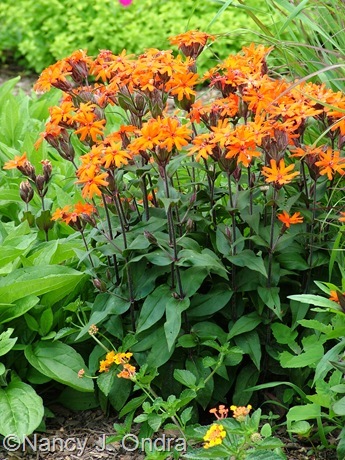 I like the zinnia Profusion Orange, I keep looking for seeds but most of the Zinnia’s are mixed colours. I especially like your first picture, I have the path now I have to get the plants! I hope you are not too cold, I have heard about all the snow you have had, it is very hard on the animals. We’re doing all right, Sylvia; at least it’s sunny here for a few days, and even slightly above freezing during the day. 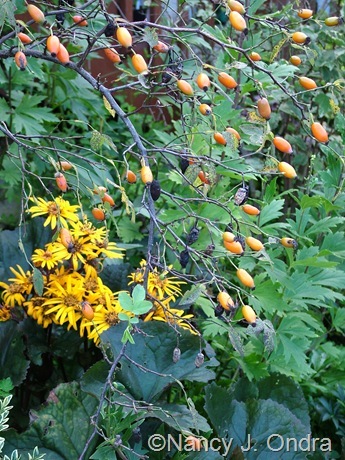 I hope you can find seeds of ‘Profusion Orange’. I really like ‘Profusion White’ and ‘Profusion Cherry’ too, and there are more colors as well. I really appreciate the way you capture the garden in your photographs. It warms the heart on a cold day. 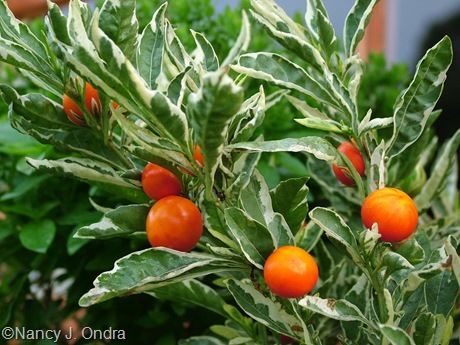 My belamcanda chinensis are 4-5′ tall. What could be going on? They are much better to look down at. Sounds like you have great soil, Susan! Mine usually get maybe 40 inches tall. I think I’d like them at eye level. Thanks, Shady – yes, this post was a treat to put together. The log house is great, but you’re right: I could easily have an igloo at this point. That’s Daniel in the snow: one half of the Duncan-and-Daniel duo. 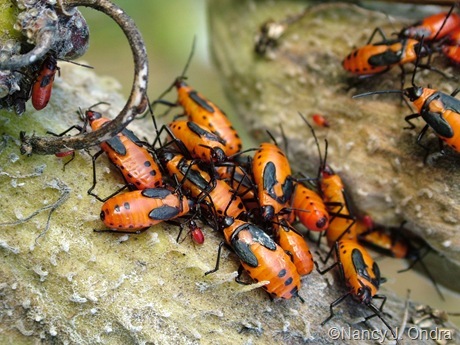 Lovely photos–I can never understand why some people have such an aversion to orange! It’s such a beautiful, stand out, warming color. What fun to see so much color in February. Your photos are wonderful. My favorite color to combine with orange is pure, bright white. It’s not elegant, but it makes me smile every time to have clown colors in the garden. Thanks for the bright reminder of summer. 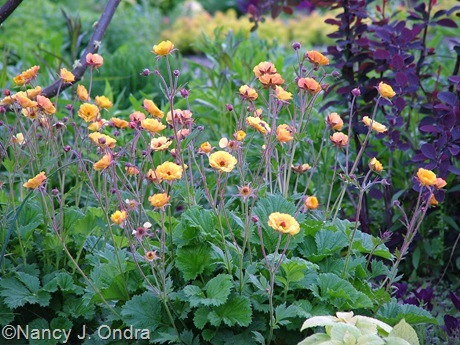 And thanks to you and the HPS/MAG Seed Exchange, I’ll be enjoying some great orange marigolds this summer. Can’t wait! It is amazing that all those hot colors are blanketed by so much snow. 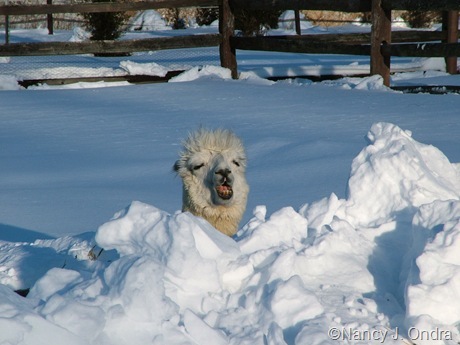 I love the photo of your lama. What a hoot. You’re so right, Lisa – at this point, it’s hard to remember that there’s much of *anything* under all this snow. At least we’re getting some good melting today. Pretty soon, we’ll be complaining about mud, I guess. That last picture is a good one! I hope they are enjoying the weather and the snow up there. I don’t know that I have anything for Bloomday either – nothing outside anyway. I don’t get very excited about the indoor plants for some reason. 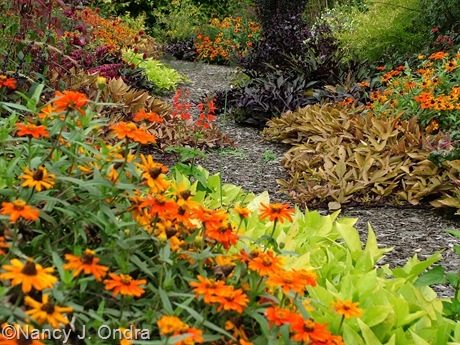 I think with all that orange you could write a book just on the color orange in the garden! Hi Dave! I wouldn’t say that the boys are enjoying the snow; they’d much rather have some grass to graze on. At this point, I’d be happy to see grass too! All that orange is warming as we watch the first snow we’ve seen in many years drift down. It never snows here — until today. What a weird winter it has been, and still more to come. 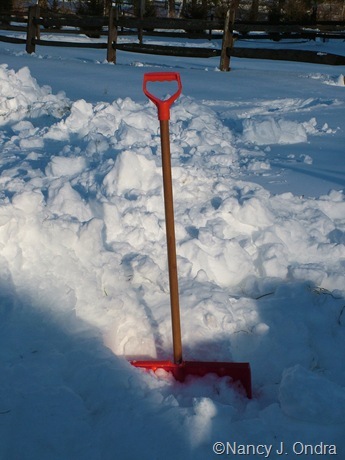 I hope you had just enough snow to enjoy the novelty and not so much that you had to shovel it. It’s frustrating to spend so much time with a shovel and not get the fun of planting afterward. Seeing all of your orange almost makes me want to do the rainbow posts too – but I might get stuck on orange – it’s such a delicious color. I’m always amazed seeing so many of my favorite plants in your garden. – Like the zinnias, pocket melon and dicleptera. I’m loopy for that plant. 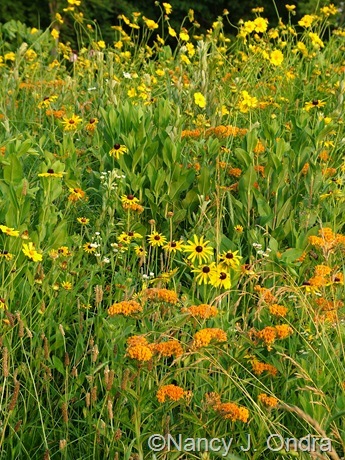 And I have been coveting belamcanda for ages… And I love that you included orange wildlife – perfect. By now, you can’t be surprised to see that we like the same plants, Kris! I love orange and you have some great examples with your beautiful vignettes. 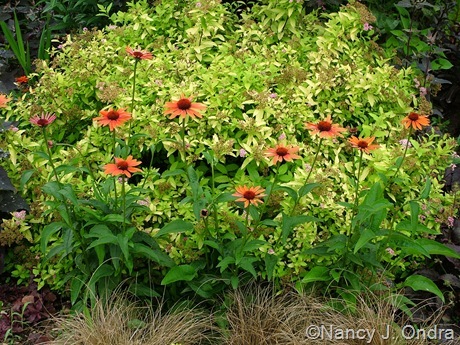 ‘Sundown’ is the only orange echinacea growing for me. 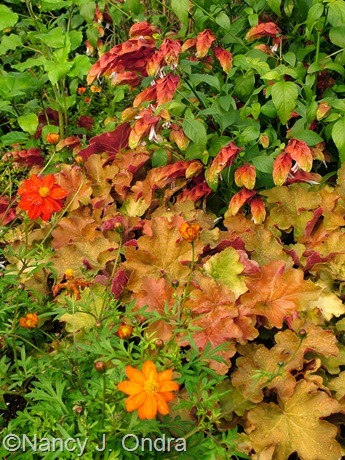 I moved those to be beside the orange agastache ‘Navajo Sunset’ for this next bloom season. 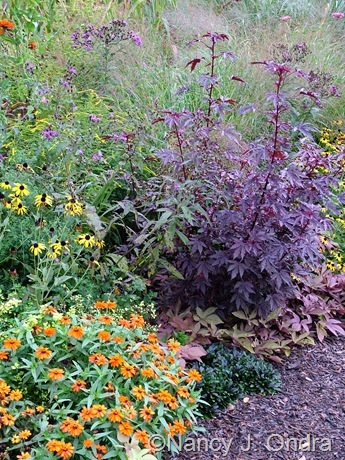 I dedicated a bed to orange and purple when I moved my perennials in the fall. We’ll see how well it works out! Poor Daniel! Do the boys like the snow? A neighboring farm that had been vacant just brought in a very large herd of alpacas. I’m talking about maybe 50 or more! I couldn’t believe it when they magically showed up last week! So cute. I cannot stop or I’ll want to bring one home with me. Ooh – I can’t wait to see how your new color bed works out this coming season. Sounds great! And how cool that you have an alpaca farm nearby. Paca poo can be great for the garden, and most farms have plenty to get rid of! You’re best admiring the critters from a distance. Sadly, they’re not as huggable as they look (they’re not mean; just not much into being cuddled). Grand tour among the orange of your garden! I spent the afternoon with my nose stuck on the monitor to see the images and do the count: I have it, I have it, I miss, I have it! Hahaha! 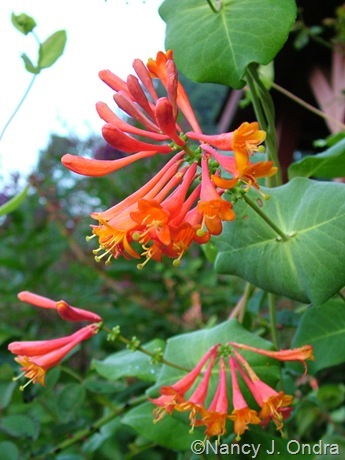 Many of the plants that you showed are already part of my garden, such as Dicliptera suberecta the Asclepias, the belamcanda chinensis, born of the seed came from far away Brazil, Geum Boris, and many other species. A post really interesting and full of good ideas. Ipomea batatas Sweet Caroline I love that I had already noticed in your book Foliage. Know where I can find it by chance? Hi Tiziana! I wish I could help you with a source for the sweet potato vine. ‘Sweet Caroline Bronze’ has to be propagated by cuttings, so you’d have to import live plants, which would probably be very difficult. Maybe there are some breeders in Europe working with the species who have developed something similar? It’s such a great color! It’s very very wonderful but I’m looking on the web, but most nurseries come from the States. If you can get other sweet potato vines, and if they bloom in your area, maybe you can make your own, Tiziana. 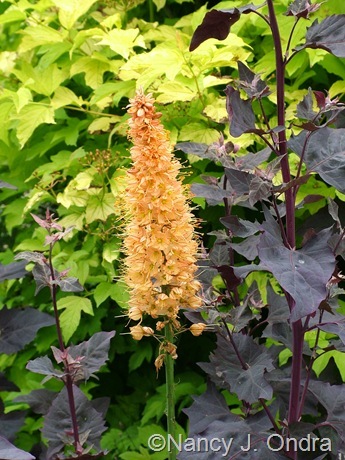 ‘Bronze’ was a seedling from a cross between a yellow-leaved selection and (I think) a purple one. 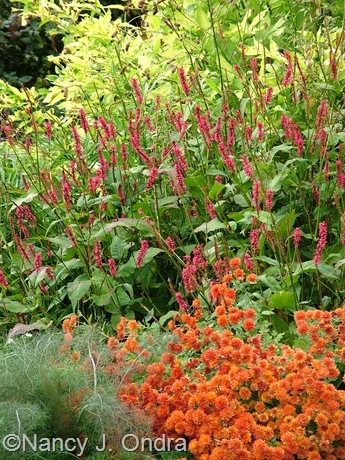 In the garden shades of orange and salmon are my second favorite-to red. 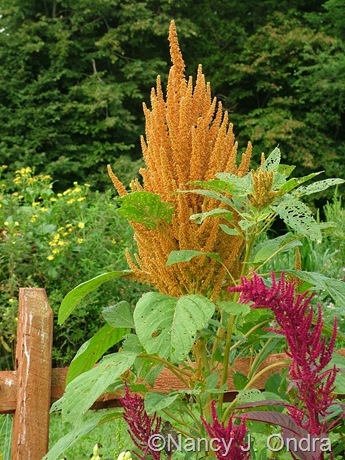 That Orange Giant amaranth really looks stunning. The shades on the foxgloves look luscious, and I dig the Solanum pyrancanthum. I read that it grows easily from seed-if I could ever find any. I am pretty sure that plant was a weed in empty lots in the countryside in Trinidad when I was a child. Chiltern Seeds in England is selling the Solanum seeds this year; I think that’s the first time I’ve seen them offered. Nan, this is an incredibly beautiful post. Everything looks just perfect. I’ve not been a huge fan of orange, but after seeing the beautiful combinations here, I’m rethinking things! Thanks, Kylee. At this time of year, *any* color looks good, I think! Anche questa carrellata di arancioni, una gioia per gli occhi! In questi giorni ho trovato una pianta spontanea di un bel tono di arancione, la Sphaeralcea Ambigua. Vorrei acquistarne i semi ma volevo chiederti, Nan, se per caso la conosci e se è di facile coltivazione. Grazie mille! I wish I could grow Sphaeralcea ambigua here, Josie; it’s such a great orange. Sadly, it’s is not winter-hardy where I live, and it doesn’t like my moist soil. If you have the right conditions for it, I hope you can find the seeds to enjoy it in your garden! I love this idea so much I had to try it myself. Your gardens and photos are always such an inspiration to me. Your plant combinations are simply wonderful. I’m honored to have provided the inspiration, Jamie! I find this when I was out in the net looking for Viburnum opulus `Annie´s Magic Gold´ and I´m blown away. Wow! 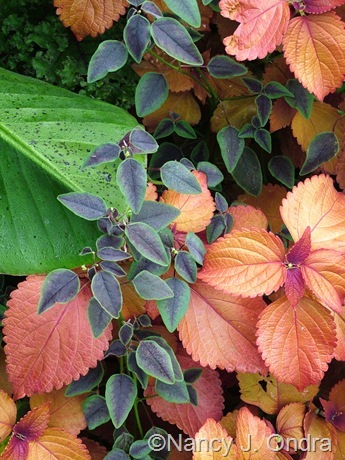 I´m very much in to variegated and different colored leaves and erlier my colours in flowers have been lilac, blue and cyklamen. 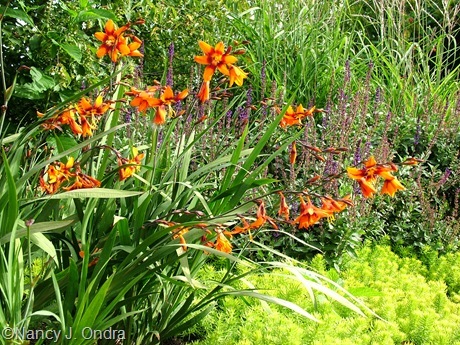 But last year I started to plant some daylillies in yellow and orange. This year I have also ordered a yellow Magnolia `Butterlies´. I´m a Swedish woman living in the countryside on the island Gotland in the Baltic Sea (outside the Swedish mainland) where we have a very good climate for plants. The best in Sweden in fact. I think that most of what you are growing – I can grow to. So I will of course visit you again. For the moment we – as you – are having lots of snow, much more than normal. The spring, which normally should have been here now, will probably be delayed with 3-4 weeks. Not fun! Thank you for your lovely photos! Delighted to make your acquaintance, Susie! I look forward to visiting your blog too. Yes, it’s been a very snowy winter, and so far, a very wet spring here. But it looks like warmer weather will be arriving soon – yay!